Revisiting the 2005 and 2004 Brunellos is a terrific opportunity to gain further insights on these two very different vintages given that some time has passed since the wines were first released. The best Brunellos from both vintages have plenty to offer, although the finest 2004s are truly superb. Interestingly, 2005 is remembered today as a warm vintage by some producers and a cold year by others. There is some truth to both views. At certain times during the growing season, 2005 was quite warm, but late season rains turned out to be the single most defining weather event of the year. Taken as a group, the 2005s are relatively compact, mid-weight wines that lack the structure, depth and ripeness of tannin that defines the very best years. With the passage of time, many wines have begun to fray around the edges and show the wilder, gamier side of Sangiovese. Very few 2005s will continue to develop positively from here. There are a handful cases where estates did better in 2005 than 2004, but they are few and far between. Readers will also note that only a small number of producers bottled Riservas. For more on the 2005 Brunellos, readers might want to revisit my original report on those wines. Two thousand four was marked by much more moderate conditions than 2005. Specifically, the weather was nearly perfect in the weeks leading up to the harvest. The challenge in 2004 was moderating naturally occurring high yields that resulted as plants unleashed the energy they had stored during the torrid 2003 growing season. Expressive aromatics, beautifully layered fruit and fine, silky tannins are vintage signatures that are found in the 2004s. The best wines remain fresh and full of life, although virtually all 2004s are approachable today. At the very top, the most profound 2004s are viscerally thrilling, majestic Brunellos on a level that even the best 2005s don’t reach. Readers will find a more complete overview of the growing season and wines in my first report on the 2004 Brunellos, which was published in 2009. All of the wines in this article were tasted over the last eighteen months. Sadly, in a few cases, wines I tasted at the properties were not as fresh as examples from my cellar. 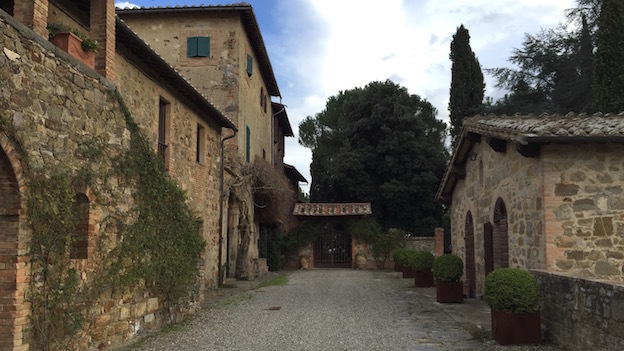 The lack of proper libraries remains one of Montalcino’s greatest shortcomings. To be fair, Montalcino is hardly alone in Italy in that regard. But it remains an inescapable fact that too many estates in Montalcino do not cellar their own wines under ideal conditions. Still, much of Montalcino remains magical, especially with regards to light. When Sangiovese is grown in the right places by dedicated producers, the results can be stellar, as these notes show. Readers should consider checking in on their 2005s, while the 2004s still have plenty to say.